Chicago—Leslie Hindman Auctioneers’ October 31 sale of The Adventure & Exploration Library of Steve Fossett, Part I, featuring works from the fields of aeronautics, exploration, circumnavigation, and mountaineering, realized over $664,000. With strong bidding across all channels, the sale put the Fine Books and Manuscripts department on track for a record-setting year. The collection achieved several milestones for the Fine Books and Manuscripts department at Leslie Hindman Auctioneers. The auction was not only the first single-owner sale for the department but also its highest grossing sale for the department in firm history. Exceeding expectations, the collection had a nearly 90% sell through rate. Highlights include a signed copy of a rare variant of Ernest Shackleton’s Aurora Australis, the first book printed in Antarctica, which brought $87,500 against a presale estimate of $60,000-80,000. 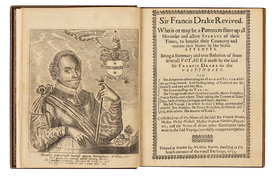 A first collected edition of Sir Francis Drake’s voyages, Sir Francis Drake Revived surpassed expectations realizing $20,000 against a presale estimate of $10,000-$15,000. Offered at auction for the first time and also exceeding presale estimates, The Forthcoming Antarctic Expedition, Robert Falcon Scott’s rare exposition of his plans for the Terra Nova Expedition which was unknown to bibliographers, sold for $5,500. Other highlights from the sale include a rare variant with text printed on vellum of the first edition of Humboldt and Bonpland’s Vues des Cordillères, et monumens des peuples indigènes de l'Amérique, which realized $37,500, and a copy of the first edition of Leo Africanus’s A Geographical Historie of Africa, which realized $8,750 against an estimate of $4,000-6,000. Gretchen Hause, Director of the Fine Books and Manuscripts department, comments: “We are honored to have been entrusted with the sale of Steve Fossett’s remarkable adventure and exploration library. This important collection includes fine copies of the most important works in the field, which closely relate to his own record-setting pursuits as an adventurer. We look forward to offering the second part of this collection at auction next spring.” The sale of The Adventure & Exploration Library of Steve Fossett, Part II will be conducted on Friday, March 15 at 10am in the Chicago saleroom. The fall season continues for the Fine Books and Manuscripts department with two November sales. On November 12, the department will offer the Fine Cartographic and Printed Americana Collection of Evelyn and Eric Newman; the season will conclude with the Fine Printed Books and Manuscripts sale on November 13. The Fine Books and Manuscripts department is currently accepting consignments for spring auctions. For more information, visit www.lesliehindman.com. Image: DRAKE, Francis, Sir. Sir Francis Drake Revived. London: Printed for Nicholas Bourne, 1653 [i.e. 1652].